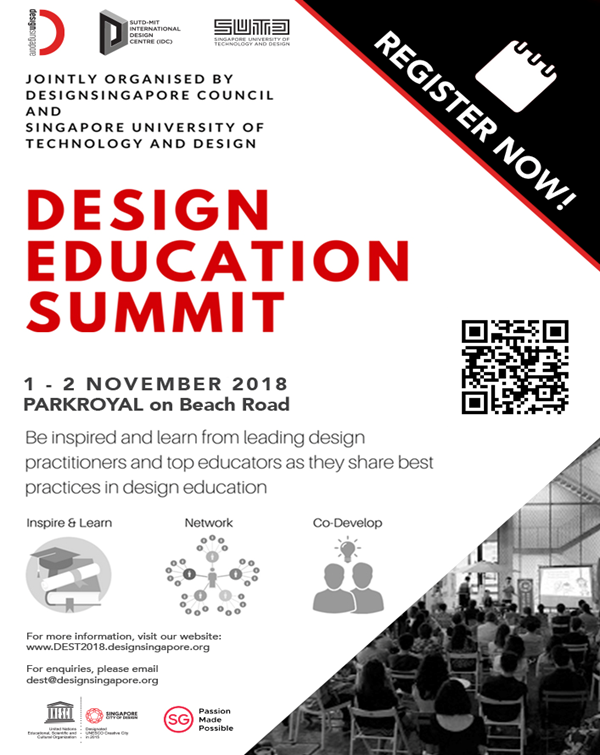 DesignSingapore Council is pleased to present to you our inaugural Design Education Summit taking place from 1–2 November 2018 in Singapore. This event is organised in partnership with the Singapore University of Technology and Design and Design-Massachusetts Institute of Technology (SUTD-MIT) and International Design Centre (IDC). Inspire & Learn: Inspire educators on evolving global design, innovation trends and the value of design. Encourage the exchange of ideas and information between Singapore and international educators in design. Network: Congregate leading educators and industry professionals that had applied design to Singapore. Nurture network between local and international educators and industry professionals. Co-develop: Discuss the evolution of design skills and how education institutions need to respond and prepare the workforce for the future. Through presentations from industry and educational experts as well as panel sessions and interactive workshops, the summit will provide collaborative opportunities for educators to co-develop strategies to cater to evolving design education needs and work on issues and possible solutions of introducing design in different types of education. You may register by clicking on the link here to register.